Aren't you always curious to visit a new place each time there is a holiday? That inner surge which comes from within to explore travel destinations along with friends and family with excitement touching the highest peak is irreplaceable. Today, our topic of travel discussion is Abhaneri. It is a small village flaunting the Dausa district of Northern Rajasthan. It is only 95 km away from Jaipur. Goddess Harshat Mata is proclaimed to have waved her wand of 'brightness' or 'abha' over the place as she was in a jovial mood and thus, it became famous as the 'city of brightness'. It would interest you to know that the actual pronunciation was 'Abha Nagri', which quickly dissipated with time. King Raja Chand of Gurjar kingdom proudly built the beautiful place in the 9th century which is about three thousand years old, but still praiseworthy. Be it the Chand Baori, the mesmerizing Harshat Mata Temple or the engaging folk dances: each is charming in its own manner. If you love a showery drizzle, then the months from June to September could be ticked off on your calendars to visit the village of Abhaneri. If not, October to March is always ideal as the weather is comparatively cooler. You definitely cannot miss the village on the Jaipur-Agra highway. You are welcomed to Abhaneri via rail, road and air conveniently. The village is 90 km and 30.9 km away from Jaipur and Dausa, respectively. By Air: Have you heard of the Jaipur Sanganer Airport? You can easily commute via a taxi or bus from there and bingo! Your awaited destination shall arrive within minutes. By Road: There are frequent buses between Abhaneri and Dausa, Jaipur, Ajmer, Agra, Alwar, Bikaner and Bharatpur. By Rail: The Dausa railway station also plays a key role in bridging the gap between Abhaneri and other important cities of the state and country. The highlights of this place which make it a popular attraction for the tourists are the Chand Baori, the Harshat Mata Temple and the folk dances, namely Ghoomar, Kalbelia and Bhawai. I am sure a little detailing of each place shall lure you into visiting the intricate village as soon as possible. Have you watched the movies The Fall and The Dark Knight Rises? 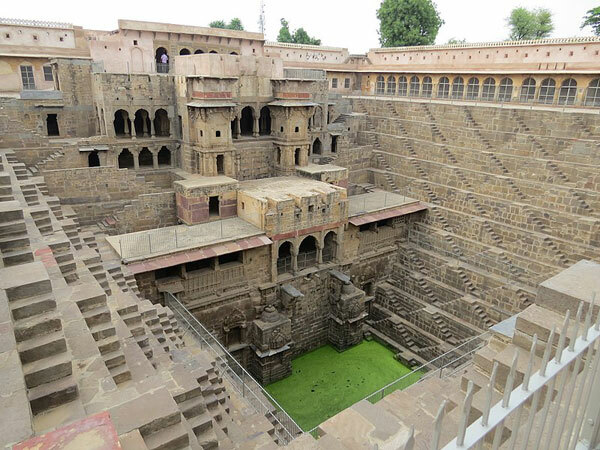 If yes, you definitely would have come across this spectacular stepwell which is 100 ft deep and has 3500 narrow steps in 13 storeys. When you look at a blueprint of the Baoris, stairs can be viewed on three sides and the fourth side has marvellously built pavilions one on another which poses an alcove for fascinating carvings with a religious touch and tourists shall definitely fall in love with the impressive sculptures! A variety of rooms are present to house the royal kings and queens and not to forget the grandeur of the performing arts stage area. The geometric step pattern is simply unique, I must add. This temple, serving as an excellent example of pure finesse and stunning architecture, dates back to the 10th century AD. It helps us to smoothly sail into the glorious period of medieval India and the wrecked images in the temple are symbolic of the fact that the temple was a tribute to Lord Vishnu. But do you know what Goddess Harshat Mata was also known as? The goddess of happiness and joy as she sprinkled bouts of ecstasy across the entire village and the devotees were delighted to receive her happy vibes. A three-day fair is held as a token of respect for the goddess during which devotees from neighbouring villages come together to seek her blessings. Kalbelia: The tribes of Rajasthan display full expertise in this snake-charmer form of dance. The get-up is extraordinary and the dance form pleasurable with a nice beat to it. Bhawai: This dance form has a linkage with the Bhawai community. I bet you shall have your eyeballs rolling and mouths gapings as they balance 7-8 earthen pots on their heads with complete ease while dressed in a traditional attire. Ghoomar: An absolutely popular folk dance performed in colourful ghaghras by the Bhil tribe shall leave you speechless with its flawless magic, I guarantee! A few restaurants dot the Sikandra area. Some snacks and Indian meals can be grabbed from near the exquisite stepwell. Well, what are you waiting for? Do not miss the golden chance to drop in at this appealing holiday spot and add memories to your travel diary!